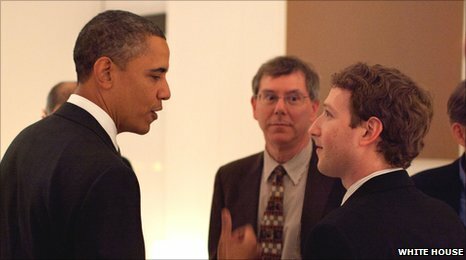 US President Barack Obama has met Silicon Valley bosses, including Facebook founder Mark Zuckerberg. Apple’s Steve Jobs and Google chief executive Eric Schmidt were also present at the private get-together in California. The president had been seeking the views of technology leaders as he works to turn around his country’s ailing economy. Mr Obama has said he wants to encourage American businesses to invest more money in innovation. Among those meeting the president were the bosses of Twitter, Yahoo and Oracle. Apple’s chief executive Steve Jobs was in attendance, despite media reports that his health had taken a turn for the worse. US newspaper the National Enquirer published pictures, said to be of Mr Jobs, looking emaciated. He is currently on his third medical leave of absence from Apple since being diagnosed with pancreatic cancer in 2004. Thursday’s meeting with the president was a private event, hosted by venture capitalist John Doerr.